Nearly 65% of all US employees don’t feel engaged* in the work they do, and there is plenty of evidence to suggest that this is no different in any other country. That is close to two thirds of the working population who are turning up, doing work, getting paid, and going home. 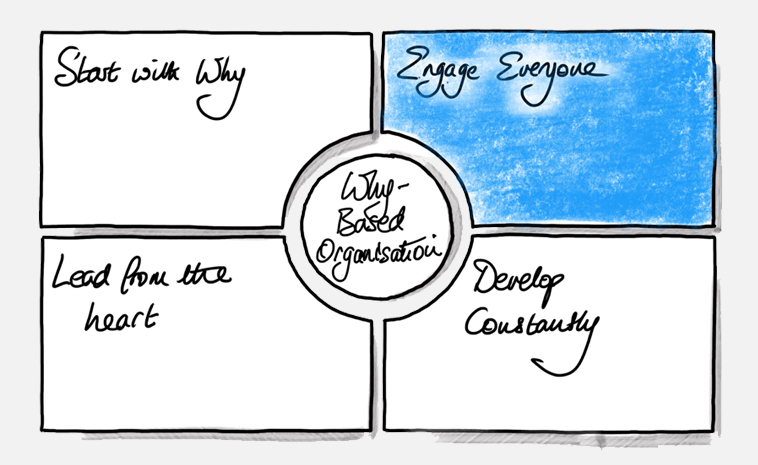 What are these type of organisations missing, and why does it matter? We are privileged to be working for one of the Police Service in the UK. They have Discovered their Why and are starting to engage with their people in new ways. They are about to embark on a huge transformation of the way they deliver their services to the community, which means everyone’s job will change, and will define and prove a new, more efficient model for Policing. They are engaging everyone – starting with their Why – to touch, move, and inspire people by painting a vision of what this new world will look like. It’s not just about communicating with people, but touching, moving, and inspiring them, and painting a picture of how everyone inside the Service will be enabled to do more of what is important to them. This is their contribution to fulfilling on the Service’s Why – serving everyone in the community to ensure they are free from harm, so that they can lead fulfilling lives. The amount of energy that is being released, in terms of support, ideas, creativity, and innovation is unbelievable as people engage with this vision, take action, solve problems, and contribute to bringing these new ways of working into existence. We call this discretionary effort, where people choose to bring more of themselves to the work they do. This does not feel like a normal change process, where ‘resistance’ has to be overcome and things are ‘rolled out.’ More like a tidal wave of human potential energy being released in service of a higher purpose. Engaging Everyone, in a way that we can all ‘see’ how our work contributes to enabling our organisation to fulfill on its higher purpose, its Why, gives real meaning to our work. Perhaps you’ve heard the story of the NASA toilet cleaner, who, when asked by President Kennedy as to what it was he did, replied, “I’m helping to put a man on the moon,” demonstrates this point exactly. Toilet cleaning with real meaning! I have observed that to engage us all in this way, and give us access to a fulfilling work life, there are three fundamental keys. Doing Important Work – knowing how our work contributes to our organisation’s cause, purpose, or belief. Being valued for our unique contribution – feeling appreciated for your particular strengths, talents, and who you are. Being part of a family – feeling cared for inside your organisation as you would care for your own family members. AND…. not getting lost in doing the day-to-day stuff! And here’s a test for us all. If we’re not going home and talking to our family and friends about the contributions we’re making to our organisation, how that makes us feel, what we’re learning and, most importantly, the difference it is making to other peoples’ lives, we are probably one of the 65%. Freud said that “love and work are the cornerstones of our humanness.” Let’s build organisations that are full of people that love the work they do. This makes so much sense from both a human perspective, making us feel more fulfilled not just at work but in the whole of our lives, and makes sense from a business perspective – creating sustainable, high-performing businesses. WhyNot Partnering (www.whynotpartnering.com), is an organisation dedicated to transforming the nature of work, by creating Why-Based Organisations**, where trust, loyalty, collaboration, and integrity are the norm – and high performance the outcome. To stay connected with us and to hear more about our work, follow us on LinkedIn.